Three quarters of poor people in Africa (an estimated 90 million people) live in rural areas and depend on agriculture for their livelihoods. Western Kenya is one such area. Extensive agriculture, deforestation and overgrazing has reached alarming levels in some areas. Lack of access to markets is a problem for many small scale enterprises, and the rural population can be poorly organised, often isolated with no safety nets or poverty programmes. HIV/AIDS is also changing the profile of rural poverty in Africa. It puts an unbearable strain on poor households in these rural areas where labour is the primary income earning asset. The labouring middle generation is depleted by illness and vital knowledge is not being passed from one generation to the next. 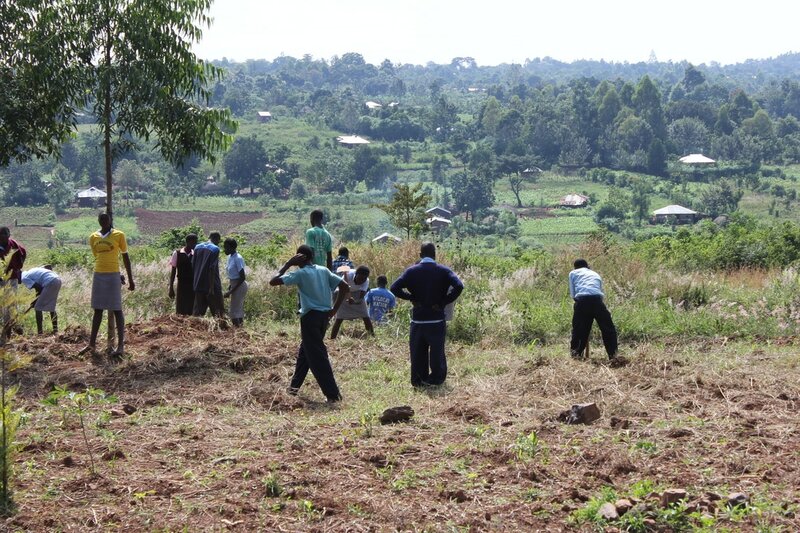 Agriculture is a core subject in the curriculum of rural Kenyan schools, including Imprezza Academy. Together with self-help schemes and local agriculture education centres the people are trying their best to improve lives. Imprezza Academy is well on the way to producing food to help feed over 300 mouths each day. Using newer conservation agriculture methods it is possible to maximise yield when the elements are against the farmer. Think hot days, blistering sunshine and torrential downpours of rain. The agriculture teachers at Imprezza, Ken and Benedict, educate and encourage the students in their endeavours to produce food, experimenting with different farming techniques to yield the best crops. Typical foods grown are cereals like maize, corn, millet and sorghum: root crops such as cassava, sweet potato and arrowroot; vegetables such as onions, spinach, tomatoes and kale beans to name but a few. Students learn to grow a variety of crops and are taught that a diverse range of foods in the diet is important to improve health, prevent disease and add nutritional value. They are also instructed on food preparation and food hygiene, and the best way to cook these foods to maintain the highest vitamin and mineral content. The conservation agriculture method of farming that is being adopted should maximise the potential of the land and allow for soil management or improvement while resisting the ravages of soil erosion, too much or too little water. When possible, crops are grown in a polyculture method alongside each other on one plot of land. This allows the replenishment of the soil. Growing legume crops with peanuts or alfalfa, for example, allows nitrogen-fixing bacteria to thrive in the soil. A spiral design of growth on raised beds resists rain water draining away too quickly and also accommodates progressive planting of seed, and therefore progressive maturation of plants so that not all the crop is ready for harvest at the same time. Founder and Director of Imprezza Academy, Catherine Omanyo, pledged to help the local community as well as the students. To this end, the successful farming methods are being shared with neighbouring smallholders. One delighted farmer from the local community said that due to his more successful farming practices, he has made enough money to be able to send his son to University. The Ecological Organic Agriculture Initiative in Africa (EOA) has been a valuable support to this end. Subsistence farmers have come together in Busia in Western Province, Kenya to form a cooperative and keep chickens. They are able to develop a much better business model by working together and are able to farm to higher standards than any one individual would be able. Each cooperative member contributes a subscription and has a role in the running of the team. 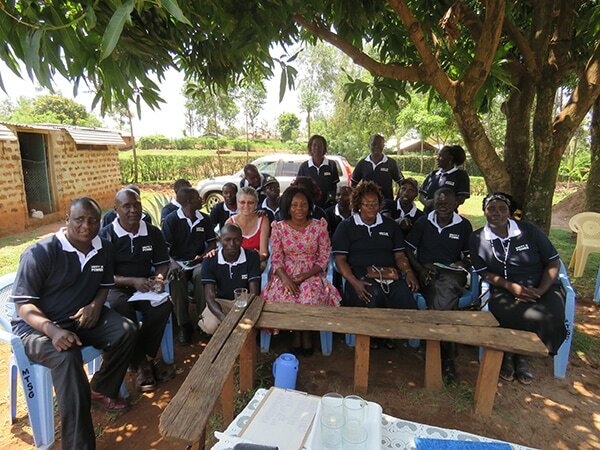 Here they are having one of their regular meetings under a mango tree, with Catherine in the middle.